Lines from a Tamil poem on defining what ‘relationship’ is… the poem draws an analogy of birds on a tree on the banks of a waterbody… when the tank is replete with water, trees will blossom, there will be fish and more for the birds – hence they will nestle in trees – but when the water body dries … birds will leave in search of greener pastures and so does insincere friends …. Now we are able to enjoy the winged visitors in the nearby wet lands… beautiful white birds – slowly landing .. wading in the water and taking off…. Mostly white plumage… ! - plumage refers both to the layer of feathers that cover a bird and the pattern, colour, and arrangement of those feathers. The pattern and colours of plumage differ between species and subspecies, and may vary with age classes, sexes, and season. Within species there can be different colour morphs. Very little (do I) know about ‘class Aves’ (not that I know other things well)…. Of course they are treat to watch… and they move from one place to another – bird migration is the regular seasonal movement - and factually they lose out in migrating – perhaps they might lose out more if they do not migrate is a paradox. The Arctic Tern holds the long-distance migration record for birds, travelling between Arctic breeding grounds and the Antarctic each year. Siberian migrant birds sporadically visit India ~ Vedanthangal in Chingleput is famous for the winged visitors from various parts fo the World. Have read of some birds : Storks - large, long-legged, long-necked wading birds with long, stout bills. Herons - long-legged freshwater and coastal birds in the family Ardeidae, with 64 recognised species (some are called"egrets" or "bitterns" instead of "heron"). Cranes - a clade (Gruidae) of large, long-legged and long-necked birds in the group Gruiformes. In Tamil, we call – Kokku, Narai, Vakka and more… for sure many of us do not the difference nor can identify them when seen…. Read that in our neighbourhood naturalists and bird watchers celebrated this Pongal with more than usual joy, thanks to the sighting of Great Knots, Little Terns and a solitary Lesser Crested Tern. Great Knot is a migrant bird that breeds in north-eastern Siberia. It migrates eastwards in winter through southeast Asia, before finally getting to Australia. It is stated that till a decade ago, about 120 species of birds were sighted at the marsh ~ now their population has sharply decreased due to various ecological disturbances in the region. 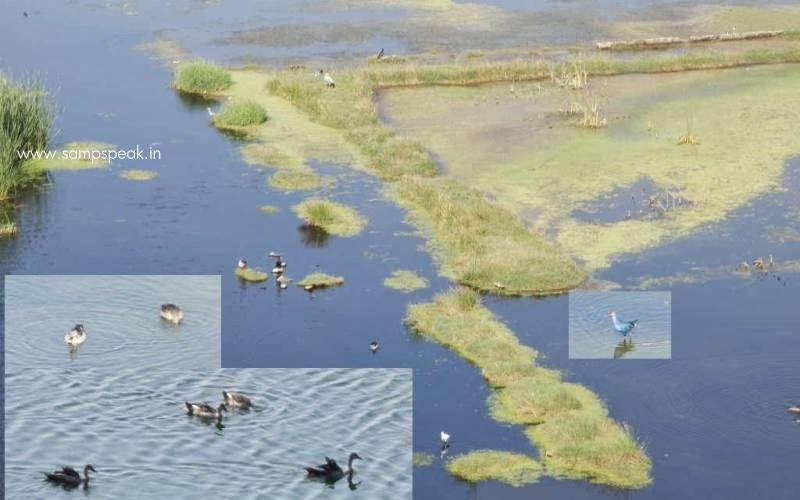 Here is a photo of some species (courtesy : ww.savingcranes.org). As a first real effort to protect the wetland, the state declared 317 hectares (780 acres) of the marsh as a reserve forest in April 2007 (Gazettee notification G.O.Ms.No.52) under the Forest (Conservation) Act of 1980. The Kancheepuram district authorities transferred the land to the forest department. – it is all about Pallikaranai marshlands. Okkiyam Thuraipakkam is on the eastern banks of the Pallikaranai marsh which has been designated as a reserve forest area and is one of the few remaining significant natural ecosystems within Chennai . Pallikaranai wetland is a freshwater swamps; one of the three in the state of Tamil Nadu, the other two being Point Calimere and Kazhuveli. The topography of the swamp is such that it always retains some storage, thus forming an aquatic ecosystem. Indiscriminate dumping of toxic solid waste along the road, discharge of sewage, and construction of buildings, railway stations and a new road to connect Old Mahabhalipuram Road and Pallavaram have all shrunk the wetland to a great extent. In 2007, as an effort to protect the remaining wetland from shrinking further, the undeveloped areas in the region were notified as a reserve forest. Pallikaranai of now is an extensive low-lying area covered by a mosaic of aquatic grass species, scrub, marsh, and water-logged depressions, reportedly connected to 31 different water bodies, all of which release surplus water into the marsh during the monsoons. It has a catchment of 235 square kilometres (91 sq mi) ; a large part of the southern region of Chennai was historically a flood plain as evidenced by the soil type of the region, which is described as recent alluvium and granite gneiss.